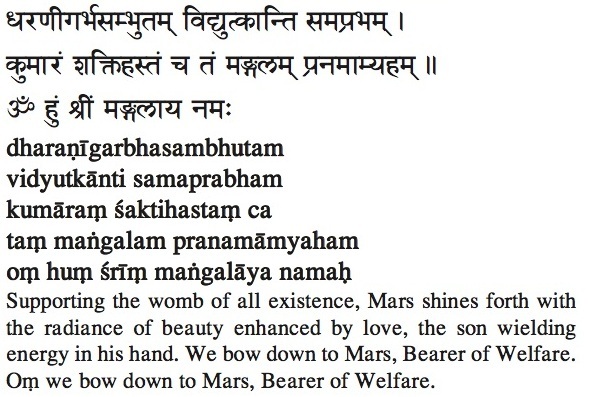 Mangal (Sanskrit: मङ्गल, maṅgala) Mars, is the Bearer of Welfare and is the planet of action through exploration and protection. Mars’ characteristics include discrimination, determination and will power. 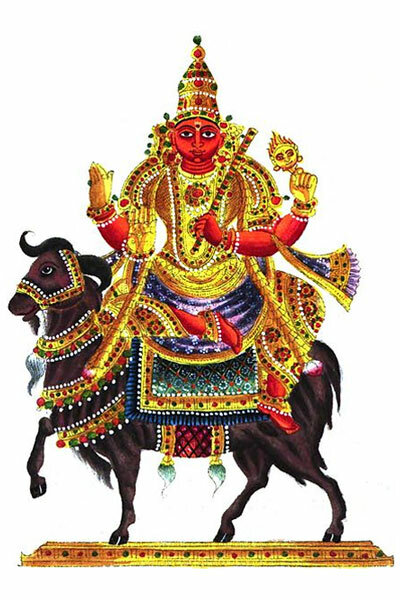 Although the Sun is the source of universal power, Mangal is the executive branch acting on behalf of that power, which is why he is the bearer of welfare. His exploratory nature leads him on journeys and missions, often alone. As the General of the Army of the Gods, Mangal protects from inimical invasions. In a social sense, Mangal manifests as the military, space exploration, and high power scientific experiments. In a personal sense he represents the immune system, blood circulation, and general masculinity.